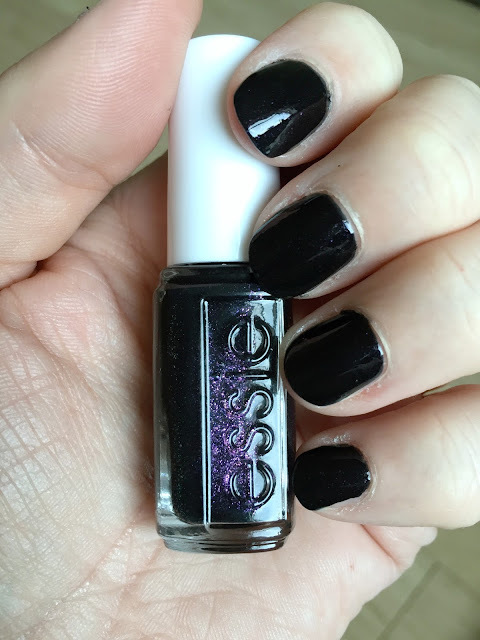 Today I have a NOTD post for you and today's NOTD is Essie's Haute Tub which is described as a black polish with amethyst shimmer. I received an Essie gift set for Christmas and Haute Tub came as part of a free gift with purchase and is part of a set of 3 mini polishes. 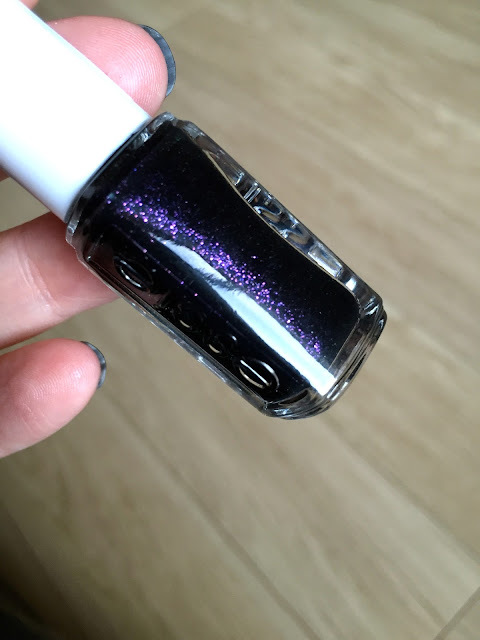 When I first saw Haute Tub I thought it looked beautiful in the bottle and couldn't wait to use it, the purply coloured glitter is very obvious in the bottle and I thought this would be the perfect day to night polish. To achieve the opaque colour I applied 3 coats of Haute Tub and used the Maybelline 3D Plumping Top Coat as my top coat. As you'll see from the bottle above the polish is black with an obvious purply glitter running through it but unfortunately it just does not transfer onto the nails like that at all, the glitter is barely visible and it looked like I'd applied a plain black polish to my nails. 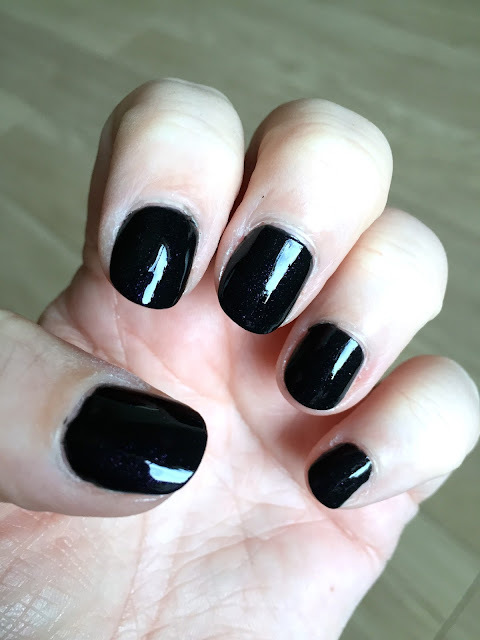 You can see the purply glitter if you look closely at my nails and when I shone a torch on my nails they looked incredible but unfortunately just looking at my nails in natural light and not close up they looked black and I was very disappointed, I am so glad I received Haute Tub as part of a free gift because I would have been extremely disappointed had I paid for it. if you would like to know more about it and my thoughts on it. 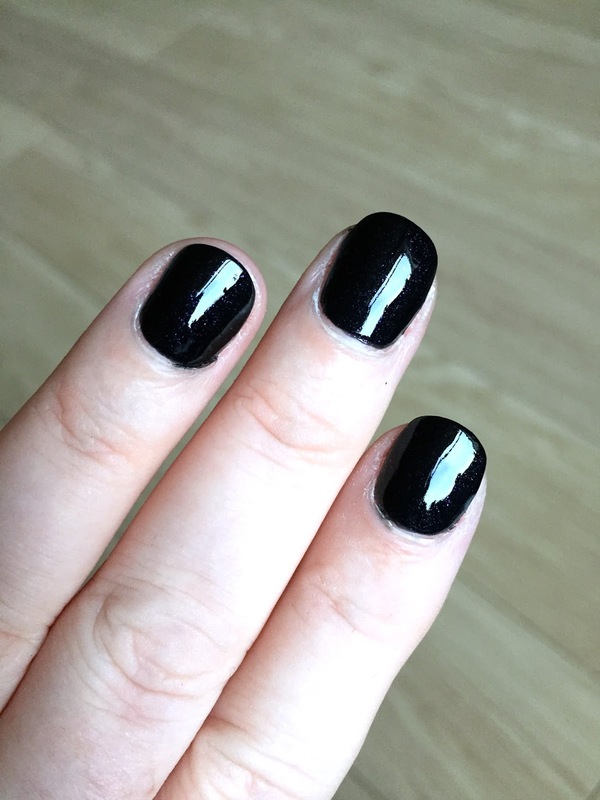 My nail polish lasted 5 days before chipping and removed effortlessly with an acetone free nail polish remover. Overall I am really disappointed in the way the polish looked as I expected something completely different. Essie's Haute Tub polish is available to buy on the Nail Polish Direct website HERE for £8.95 including delivery.